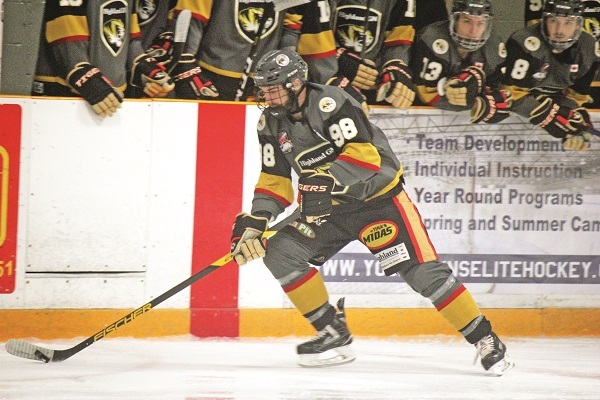 The hottest hands in the OJHL stayed lit on Sunday afternoon in the Aurora Tigers’ 3 – 2 win over the Mississauga Chargers. With the Chargers serving out the remainder of an interference call in the opening seconds of the second period, Joseph Mizzi found the back of the net for the fifth time in the last four games, putting his team up 2 – 1. Getting on the scoresheet in ten of his last eleven games, including seven multi-point efforts in that span, Mizzi has stretched his lead atop the OJHL’s scoring pace to seven over the Toronto Jr. Canadiens’ Eric Ciccolini: with a whopping 20 goals and 26 assists through just 25 games this season. Yet it isn’t just his offensive talents that are impressing Aurora brass this year. Markus Paterson and Michael Palandra also scored in the win, while Jack Irvine was solid between the pipes in stopping 30 of the 32 shots he faced. One of the highest scoring teams league-wide this season, the Tigers pat their lead atop the OJHL’s North division with yet another pair of points, now leading the Markham Royals by a comfortable thirteen point margin. Their 18-7-0-2 record has the Tigers six points back of the Oakville Blades for both the NorthWest conference and league lead. Aurora and Mississauga will meet up for their second and final battle of the season back in Mississauga on Saturday. Aurora will first contend with the Brantford 99ers (9-11-0-5) in a home game Friday, who they bested in overtime earlier this month. Puck drop Friday is set for 7:30 p.m. at the Aurora Community Centre. For stats, schedules, and more information, visit www.auroratigers.pointstreaksites.com.